Thinking about the future is plagued with unstated assumptions, misunderstood terminology, and unrecognized biases. Methodological rigor is the best defense against such, in the modern world, dangerously sloppy thinking. A standard scenario plot based on two axes (driving forces) but with an equilibrium added, where the four scenarios overlap. unity and justice on the future of Palestine. By adding a third axis, the number of scenarios is doubled and the realism increased. the nature of the environment. The degree of ideological commitment goes from an attitude of unquestioning faith in oneself to an attitude of open-minded analysis. Conflict resolution strategy goes from a strategy based on violence to a strategy based on peace. The nature of the environment in which the actor exists includes political context and whatever other contextual factors may impinge on political behavior. The figure below highlights the two extreme scenarios. The red octant represents the Conflict Scenario, in which the group being analyzed is characterized by a military conflict resolution strategy and extreme faith in itself, while operating in a challenging environment, which I hypothesize will generate conflictual behavior. The aquamarine octant represents the oppose extremes, which I hypothesize will generate amicable behavior. More important than any particular prediction, however, is use of the 3-D graph to give an idea of the direction of change, add dates perhaps to illustrate rate of change, and thus start creating a roadmap into the future that is based on history. The purpose of this is less prediction (rather ambitious) than understanding of the causal dynamics and appreciation of the range of future change that seems likely. Focusing on the key scenarios is the first step in evaluating a set of scenarios. 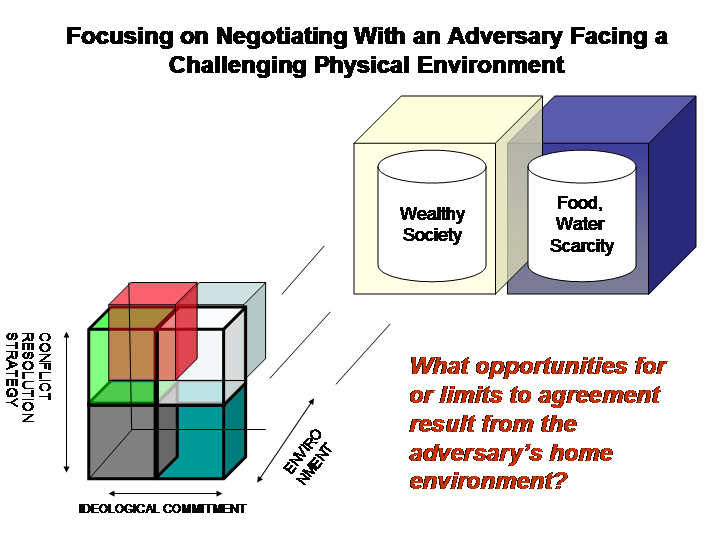 Working within an explicit 3-D environment reminds the analyst that a vast array of possible outcomes exist; the familiar choice between, e.g., “conflict” and “compromise”–as shown here–must be understood to be an extreme simplification that essentially does not exist in reality. Nothing is more dangerous as a conceptual foundation for policy-making than such an either-or attitude, which can slide without warning in the mind of a leader into the dangerously biased and artificially limiting zero-sum attitude of “good guys” vs. “bad guys.” Thus, one might label the above red quadrant “evil” and the blue quadrant “good,” but those are idealized extremes that virtually never exist in reality. 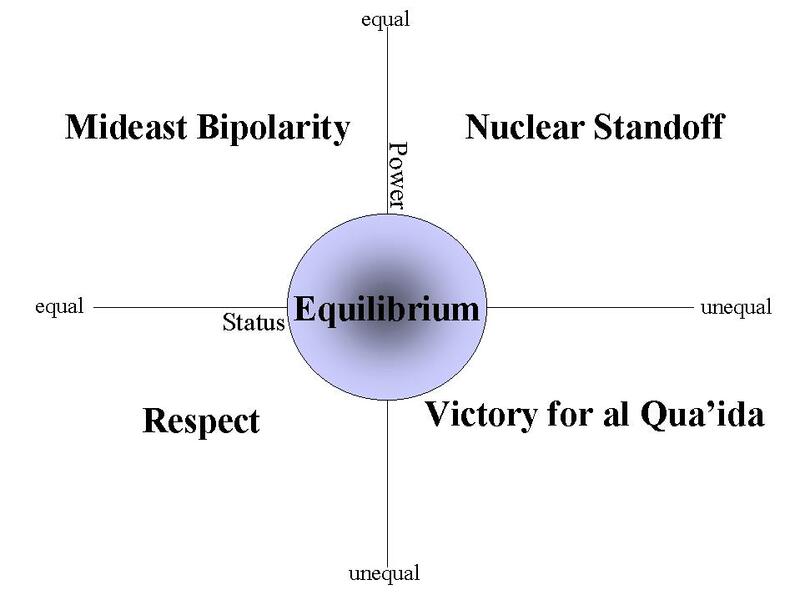 Rather, as the graphic illustrates, those two extremes represent only two of eight quadrants. The real world policy options and actual future outcomes that will exist in practice almost always fall in one of the other ambiguous regions of the outcome environment. More specifically, a real world outcome may resemble “compromise” but with a conflict resolution strategy that contains some military elements (pushing the outcome space into the green quadrant) and a somewhat hostile environment (pushing the outcome space into the upper, rear, right bluish-grey quadrant). As a guide to analysis or policy-making, the graphic becomes a tool for provoking such questions as, “Is behavior moving away from our “Compromise Scenario” or “What impact would a less military policy have on the outcome?” The graphics are only representing possibilities that a really sophisticated policy-maker might be able to keep in mind, but in practice such subtlety is frequently lost in the tortured process of negotiating a regime’s policy position. Group decision-making can easily become overly focused on achieving the rosy scenario or avoiding the ultimate disaster and descend into a debilitating group-think mentality blinding the group to alternative options. A classic example of this is to conclude that negotiating with the enemy constitutes a concession, which cripples policy-making by instantly eliminating most of the potential outcome space (compromise and positive-sum outcomes being defined as unacceptable). Focusing on some alternative within the landscape of potential outcomes may open the door to unforeseen options, such as replacing a military solution with a less risky solution taking into account the physical constraints facing the adversary (e.g., water shortages in the Mideast).